The other day a pal sent a questionable nukes post about ‘don’t eat the tuna’ from 2012 and said he didn’t know where Lucy Occupy would post such things. Lucy was actually quite diplomatic when she gently told him it was pure pro-nuker deceptions and suggested sharing YRTW No 35 would be more beneficial to his friends and neighbors…. dealing with current dangers, not minimized future-tensed dangers of sea creatures in the deep blue rad hot sea. Ahhh, the Unsuspecting Public is bombarded with tricks of the nuclear industry’s ‘play book’ ….. a little bit of truth and colossal lies, leaving a trail of ‘confusion, puzzlement, bafflement, bewilderment and bamboozlements’….. Anybody else remember in 2011 all the various and sundry notices that ‘cold shutdown’ had been achieved again and again till they just changed it to, [WTF!..] “Smiling people don’t get radiation poisoning” ?! What’s next, a rerun of ‘Run naked [and unprotected] in the [radioactive] streets’ to express concern about nuclear devastation? 😐 D’oh! #OccupyVirtually! You KNOW why! Ha! Remember when Time Magazine posted an article in 2012 saying the Fukushima meltdowns had been “averted”…… D’oh. That got quietly sanitized away, didn’t it! Remember when, back in 2012, a Google search for the FUKUSHIMA resulted in more than 62,000,000 results? Ha! Like Solar Panels and Electric Meters! The numbers spin backwards these days! START WITH THE SCIENCE AND STICK WITH THE SCIENCE. 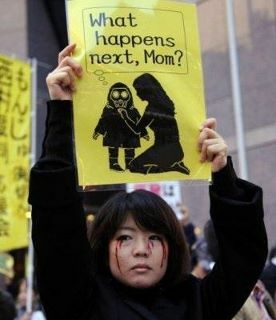 Fukushima Triple (3) Nuclear Meltdowns in progress since 3.11.11. NO EFFORTS TO CONTAIN. EPA, RADS AND FLOWER POWER?? What about the EPA AND #Radiation? Read the article to see the report. All previous YRTW columns are included on the article at the end now. Other Veterans Today Articles by Bob Nichols. Dispel some of the BS and nuclear propaganda and disinformation many of you are unwittingly sharing….